1 Free night with a 7 Night Stay !! Use code at checkout. See Rate Tab for Discount Details in every month! 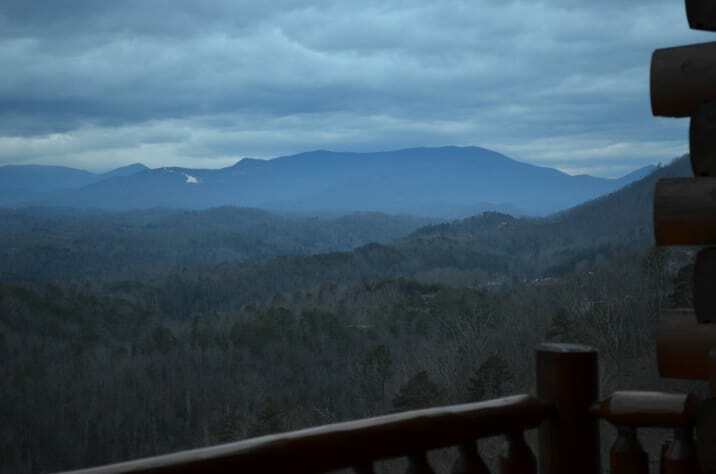 Luxury 1 Bedroom - SPECTACULAR View of Great Smoky Mountains! THIS IS IT! LAST MINUTE AUGUST SPECIAL! Stay 5 nights and use Promo Code "AugDeal"! 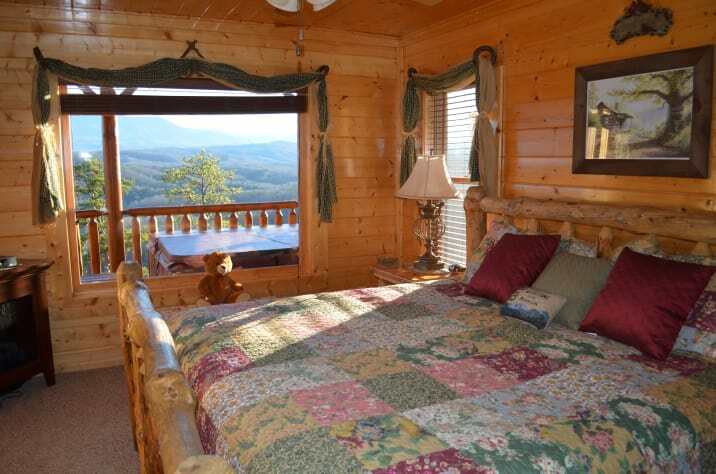 This luxury 1 bedroom log cabin has spectacular mountain views! The large fully equipped kitchen is ideal for those that want to cook that special meal! The kitchen opens to the living room with NEW comfortable leather sofas, a NEW curved big screen TV and Bose Surround sound stereo. 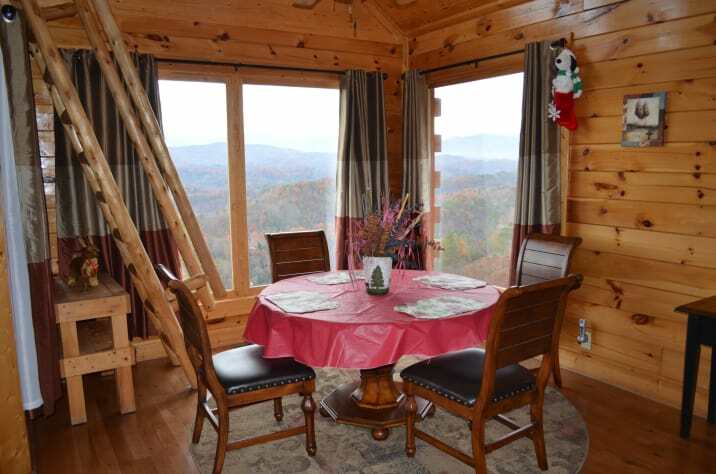 The Dining Room is open to the kitchen with huge windows overlooking the Great Smoky Mountains National Park! Cushioned out door furniture on the deck allow you to relax and take in the views. 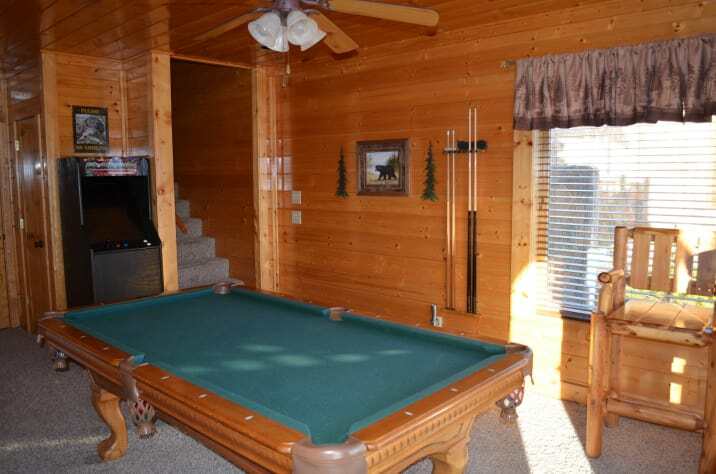 The lower level has a pool table, an arcade game, a large master bedroom with king size bed and private bath. The lower deck has a hot tub, relax after an exciting day of sightseeing and take in the Mountain Views! Downstairs, the master bedroom has a King Size bed and flat screen TV. The ensuite private full size bath has a shower and a jetted tub. On the main level there is a full bath with shower, a ladder takes you to a loft with 2 twin size mattresses, . 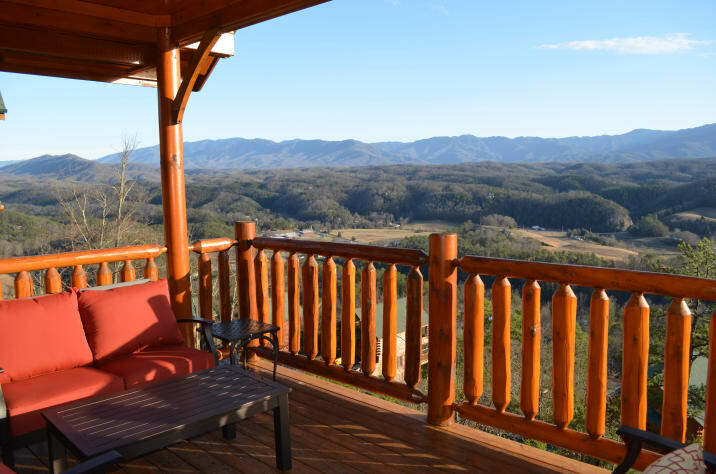 Two rear rocking chair covered porches have awesome panoramic views of Mt Le Conte and the Smoky Mountains National Park. 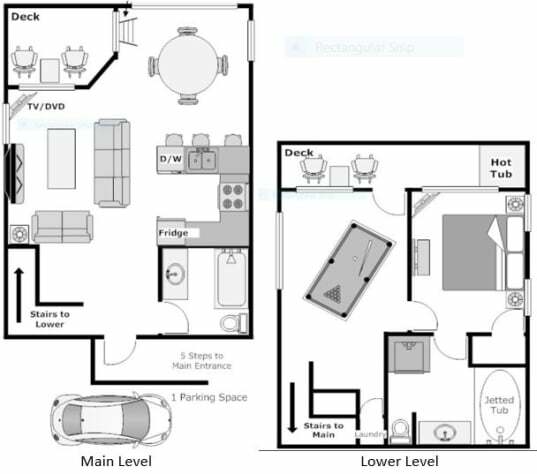 Relax in the hot tub on the lower deck which also has a cushioned bistro set, or the cushioned patio furniture on the main level, and enjoy the view! Inside the cabin there is a pool table, foosball table, arcade game with over 60 games like Pac Man, Galaga, Space Invaders, Frogger and more! Squash your confidence with the family friendly dart board. 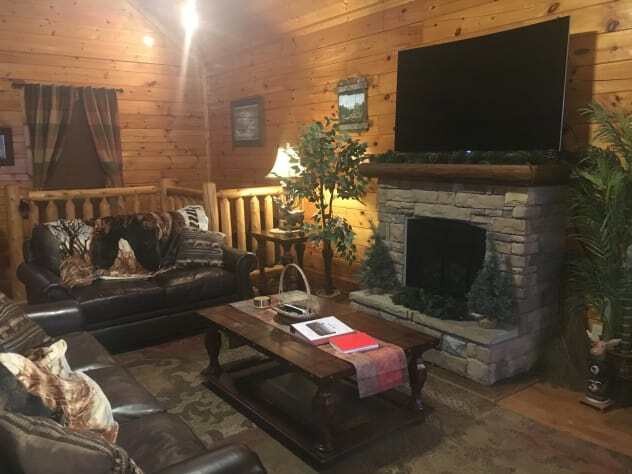 In the living room relax on the leather sofa, an loveseat and enjoy a 55' big screen HDTV with Bose Surround Sound Theater that can also be used to fill the cabin with your favorite music! There is a small washer and dryer with ironing board and iron in the closet off the game room. We have put a lot of customization in our cabin! We upgraded the insulation and added insulation to the floor. This makes the cabin extra cozy in the winter and cooler in the summer! No more drafts! The big screen TV, and arcade game make our cabin unique from the standard offered by most rental companies! 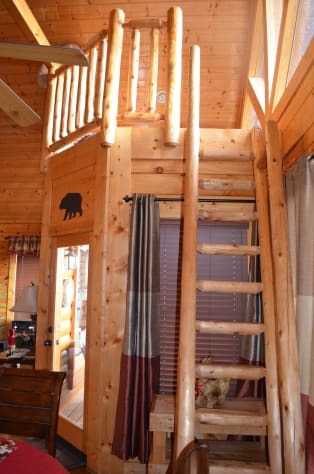 We take pride in making our cabin cozy, different and unique! Every time we visit, we improve our cabin! The cabin also has new metal roof! Enter the coupon code as follows: "mmm7N" where mmm is the month of your stay. The view is just overwhelming, I would have stayed on on the upper porch the entire time. Everything in the cabin is clean and updated. Since we came after Labor Day, it was quiet and felt like we were the only ones around. Early in the morning you could hear the roosters crowing in the valley. I'm only sorry we were only there for four nights. Jerry and Mary have made this a true home away from home. Can't wait to come back. My husband and I stayed four nights in this cabin. I cannot say enough positive things regarding our stay. The view is absolutely breathtaking and there is so much to see and do in the area. 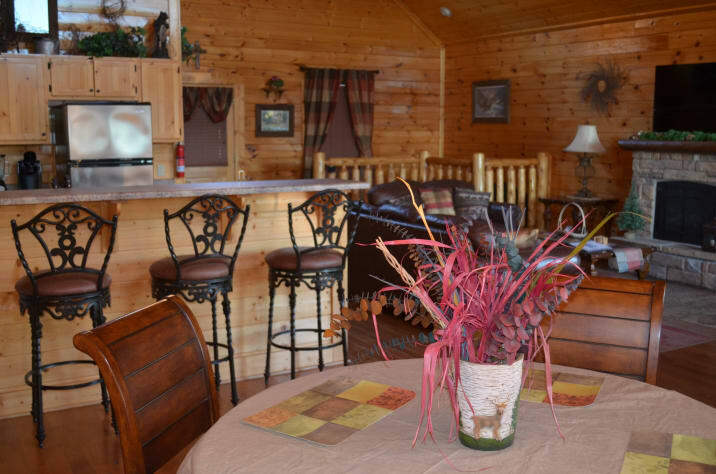 The inside of the cabin is extremely beautiful and clean, as well as completely furnished. There are more amenities and entertainment options than one could ask for including a pool table, juke box, jacuzzi, arcade game, TV with full-surround sound, etc... The kitchen is also fully furnished, so you shouldn’t need to bring anything except the food you’re going to make. One other detail that really stood out was receiving a call personally from the owner’s the night we arrived. They called to welcome us and ask whether we had any questions or concerns. This is just the tip of the iceberg, as there is so much more. I would highly recommend staying at the cabin, as I definitely hope to visit again someday! Our family visits the Smoky Mountains 1-2 times a year and we have stayed in many cabins but Gere and Mary's cabin tops them all. From the moment we walked in we knew it was going to be a great week. Gere and Mary go above and beyond to make sure every detail is perfect. If you enjoy cooking, well they have every small appliance you can imagine. A breakfast burrito maker/omelet maker, waffle maker, hot dog cooker, pressure cooker, and a hot oil popcorn maker and more. Our kids loved popping popcorn and finding a movie on Netflix to watch on the big curved screen TV with the surround sound. We took a day just to stay in the cabin to enjoy movies and the game room when the weather wasn't to great during our stay. There are also board games and puzzles for every age. Candy Land, Yahtzee, Dominoes, Chutes and Ladders. I promise you will not regret booking here. We are so glad to know you enjoyed your stay and you felt at home! We try to have an above average cabin with extra amenities you won't find in other cabins. We like to vacation at our cabin too, so equip with things to use and do. Many people tell us they want to come back and just plan a day at the cabin! We appreciate your review and hope you are able to return soon! We recently stayed at the cabin for Presidents Day Weekend, and it was a wonderful experience. The location was phenomenal, secluded enough that we were up in the woods with a great view, but close enough to town that we had many dining options and fun things to do when we wanted to get out. The cabin is extremely charming and all the detail inside really makes you feel at home in the mountains. We had so much fun playing pool and using the arcade game downstairs before hopping into the hot tub to warm up. Sitting in the hot tub and watching the sunset was an amazing experience! The cabin was great and had everything we needed for a memorable experience. The owners are wonderful and extremely helpful. We look forward to coming back in the future. The BEST place to stay in Pigeon Forge! My wife and I decided to go to Pigeon Forge for our honeymoon and we couldn't have picked a better cabin!! We arrived just before dark witch was the perfect time to see the astounding view this cabin has!! The door lock was pretty cool and easy to use. The cabin was very clean. We were amazed at all the kitchen supplies that are available to use and the big TV with surround sound was nice to! The hot tub was very relaxing and the best place to be to watch the snow fall! The light switches are labeled for what they turn on /off witch was helpful. When arriving to the cabin at night, there is a motion censor light that turns on when you pull up that was nice. The Owners were great! They were very helpful and available when we had questions. The view really cannot be captured by the lens of a camera. You must see it to believe it. Watching the snow on the mountains with the sun making the shadows was amazing!! I will most defiantly recommend this cabin. It was so peaceful and relaxing! It really exceeded our expectations and not sure if anything could have made our stay any better. I cant wait to come back again! Thank you so much Jerry and Mary for sharing you cabin with us! Everything was great. Worst part ice on steps no salt to throw down. The kitchen supplies are top of the line. Tv and sound was great. Acoustics for guitar picking was perfect. I will return. Love it! Beautiful cabin with spectacular views. Cabin is fully equipped and very cozy. I would definitely come back. The cabin was all that we expected and more! The owners thought of everything in preparing this cabin for guests! The kitchen is fully stocked with cutlery, spices, and a coffee maker. The TVs are very high quality and the living room is even equipped with a Bose sound system. The view is incredible and the owners are very responsive to texts (even when it was 10:45pm). Overall, it was a great stay! The only thing that was not ideal about this cabin had nothing to do with the cabin itself. It seems that there is someone who owns several dogs down the mountain from the cabin. The dogs barked almost nonstop and the echoes could be heard clearly - even distractingly - from the balconies. I did not reflect that in my rating of this cabin because it was not anything that the owners can control. However, guests may want to at least be aware that there may be dog barking to interrupt the peace and quiet. However, we were only there for 36 hours, so it could have just been that the dogs were barking at an uncommon rate and volume during our stay. Aside from the dogs, I'd recommend this cabin as an EXCELLENT choice! Exceeded Our Expectations by Far! Amazing cabin & views! â¤ï¸ I cried when i first stepped out onto the porch to that gorgeous panoramic view. 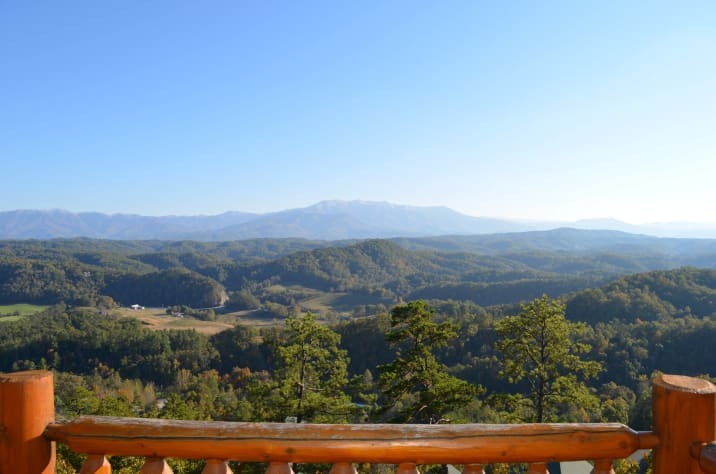 Close to pigeon forge & gatlinburg! The cabin was so cozy and we loved the BIG stuffed bear that someone left there. Brought a smile to our face... we even took a picture with it. Haha!! 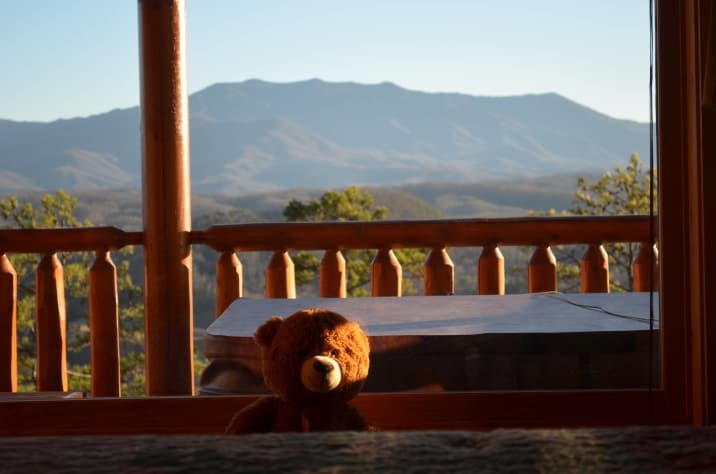 This was our best stay in the smokies yet!! 3rd time to visit. We will definitely be back! Thanks for letting us know we exceeded your expectations! The view is so beautiful, and the location is very convenient! We appreciate your review! The owners have thought of everything. Our cabin stay was amazing. Truthfully it was one of our best vacations ever. 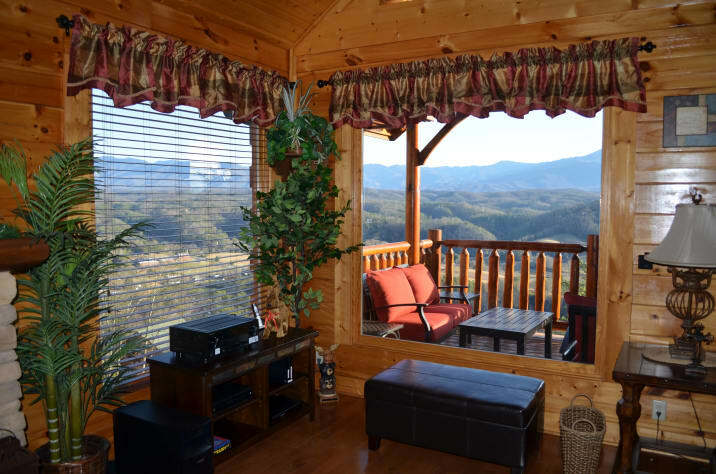 The cabin is nestled up on the mountain and it features breath taking views. Yet it was still close enough to venture out to many attractions. We went horse back riding, hiking up to Laurel Falls waterfall, shopping at the mall and enjoyed a great dinner comedy at the Hatfield and McCoy show. We enjoyed it and cant wait to go back again. Thank you for making everything so easy for us. This was a 2nd honeymoon kinda trip. We needed a break from Key West after Hurricane Irma and this was it. First of all, the cabin looks like the pictures. No surprises. My wife and I looked at several other properties from " cheaper" websites while we were there (already planning a second trip), and none of them looked like the photos. So be careful. Secondly, this cabin is in a nice subdivision with paved roads and flat parking. That will be more important than you know, once you're there. The views are spectacular. Lastly, the owners are great people and great communicators. They let us reschedule our trip at the last minute because we were dealing with Hurricane Irma in September even at a possible loss of vacancy to them. We would have no problems what so ever to stay here again. Our only problem is, we need a bigger cabin because we've bragged up our trip so much that the whole family wants to come. 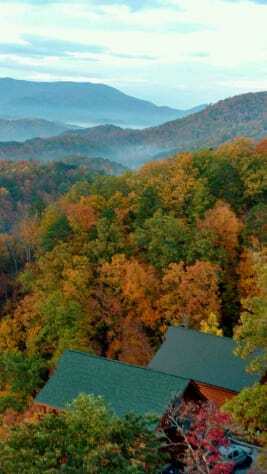 The Smokies have been a family favorite for the last 40 years. We have always rented cabins so we have stayed in many!! This was the most beautiful, best floor plan and greatest view ever! Jerry is wonderful to work with and checks in to make sure you are comfortable during your stay. We will definitely be staying at this cabin next year! I will recommend it to all my family and friends! Lovely cabin! What more could you ask for? This luxury cabin was everything we hoped it would be! The cabin was nice and clean when we arrived. 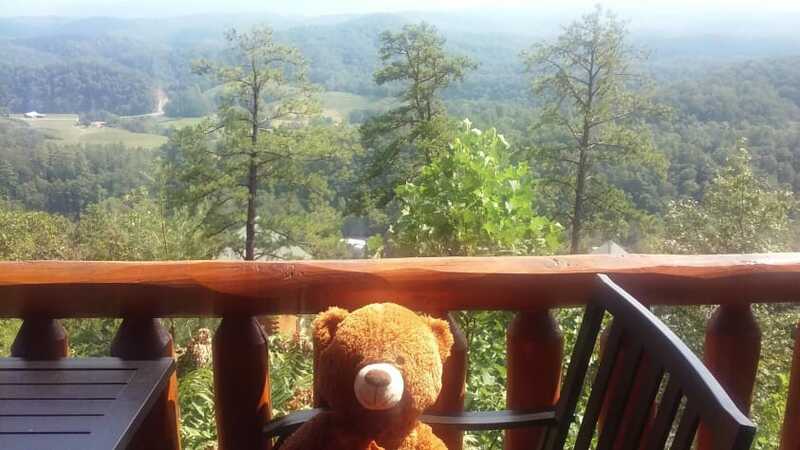 The location is close enough to Pigeon Forge to be convenient but far enough away that it is quiet outside on the deck. Absolutely beautiful cabin with the best views! Our stay was amazing and the cabin met all of our needs/ wants. It was clean and had all the amenities you could ask for and we were impressed with the Bose sound system & Pioneer receiver! We love our music and hanging out at night listening and dancing to music was awesome! Now the views from the cabin looking south gives you a panaramic view of the mountains! It was just a great place to hang out and relax after long days of exploring! 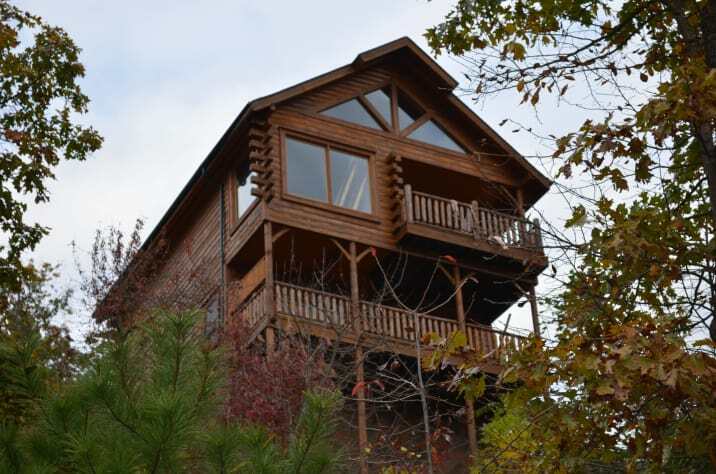 I highly recommend this cabin for couples looking for some time away and to spend time falling in love all over again. I actually proposed to my fiancé out on the deck and will treasure the moment forever! This is the second time this year we stayed at the Majesty this time for twelve days. 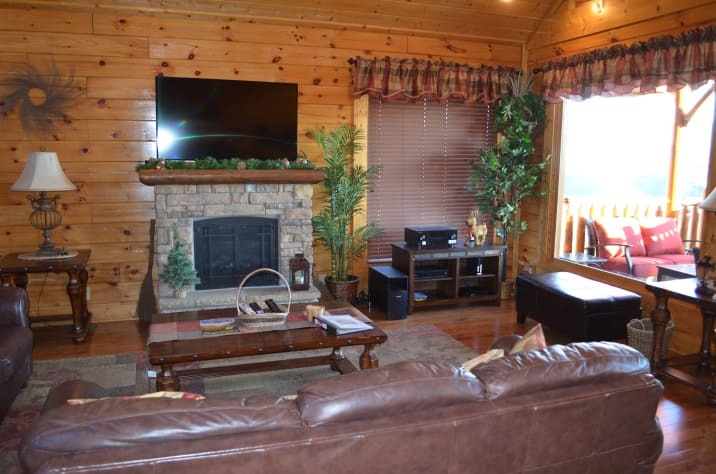 The cabin is spotless and has all the latest amenities and property owner are great. 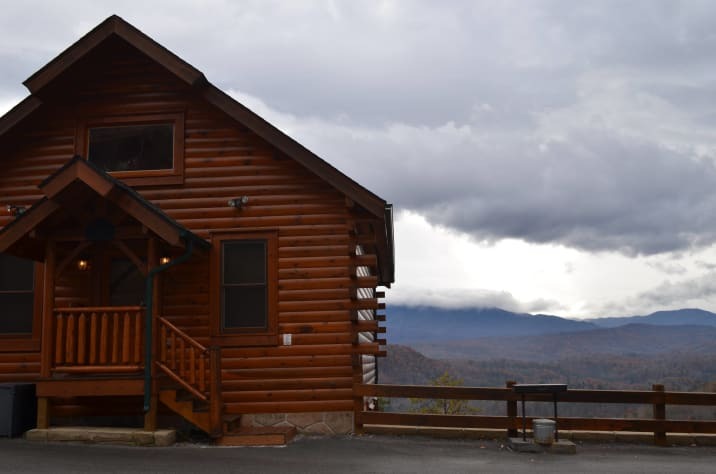 I recommend this cabin it has great views and just far away six miles for Pigeon Forge to be remote, but close enough to get to all the surrounding places easily. 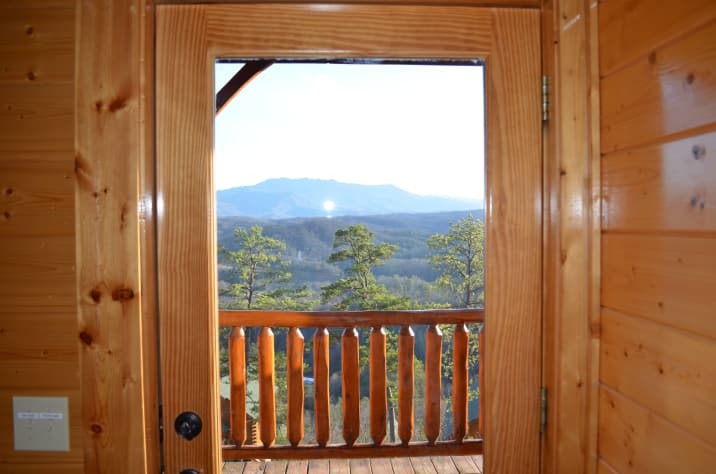 When I am looking for a cabin rental in the mountains, one of the most important features the cabin must have is a view of the mountains. I have found that it just adds so much to your vacation to be able to walk outside at any time and see a spectacular view. Isn't that part of what going to the mountains is all about -- seeing the mountains? 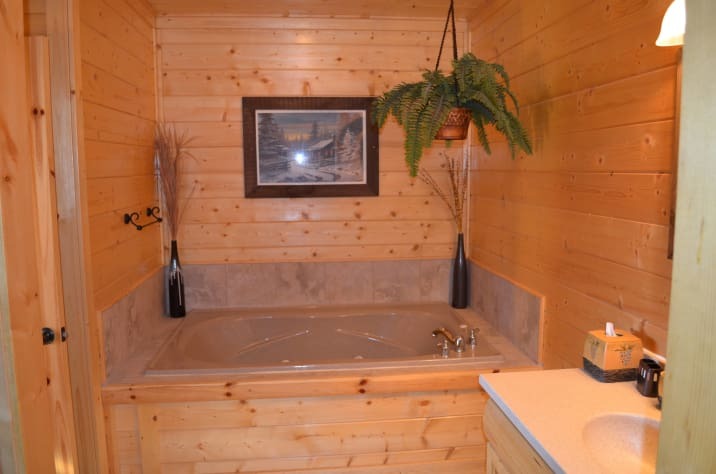 So, when I found Majesty cabin on VRBO, I was intrigued. The cabin had so many excellent reviews, and most of them included high praise for the views from cabin. 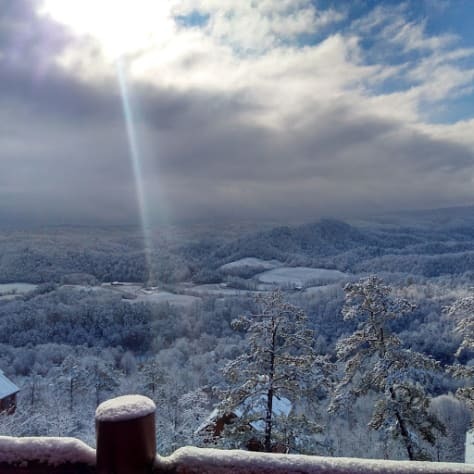 After staying a few days at this cabin, I can assure you that the views are indeed stunning! We were impressed! Even without the view, the cabin is comfortable and very well equipped! The furniture is comfortable, and the cabin includes so many "extras" that take it to the next level. It has every kitchen appliance you would likely need... an amazing curve-screen TV with 4K technology (What a picture! I am going to hate to go back to my TV at home...), a hot tub, a pool table, and an "arcade" style stand-alone video game system with several "vintage" (1980s) video games on it (e.g. PacMan, Space Invaders, Galaxian, Galaga, Donkey Kong, etc.) -- a nice touch. The cabin is in a small "resort" of cabins along the side of a mountain. There are cabins around your cabin on all sides, but they are arranged such that you barely see them or notice them. Majesty was so comfortable, and it had such a great view (and other "stuff"), we enjoyed spending some of our time there just relaxing. It is just a few minutes outside of Pigeon Forge, so you are close enough to restaurants, etc., so location is not a problem. The owner (Jerry) was super helpful. The first day, we had some minor issues getting the TV to work properly (power-cord into TV was slightly loose), the hot tub was a little too hot (easily remedied), and the temperature in the cabin needed to be slightly adjusted to fit our comfort zone. I was able to directly call or text Jerry, and he worked with me to get everything exactly as we needed it very quickly! He even checked back with me a few times to make sure things were good. Price-wise, it was a little more than some similar-sized cabins, but I didn't mind spending just a little more to have confidence that we were getting a great cabin and view -- and we did! Also, it is obvious the owners truly care for their cabin and their guests. Thanks for a great stay and great vacation! We hope to come back again some day! Spectacular views, and an amazing cabin. Surpassed our expectations! Absolutely beautiful cabin, with an absolutely beautiful view! The pictures just don't do justice for both the cabin itself and the views. Cabin feels very home-like and welcoming, has great amenities, and was very clean. 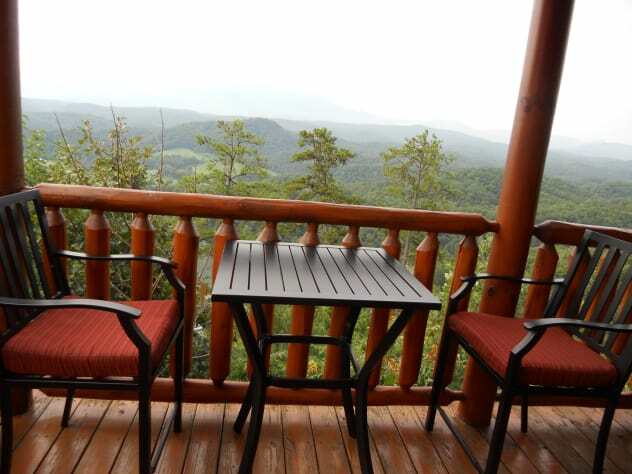 Not very far from attractions, about equal distance to both Gatlinburg and Pigeon Forge. 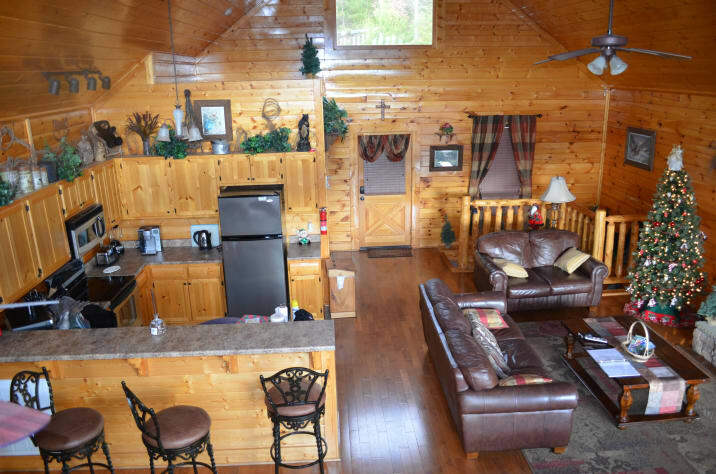 If/when we make another trip to the area, this cabin will most definitely be our first choice when booking our stay! We really enjoyed our stay at Majesty. The cabin was very clean when we arrived, and even though we made it in late, Jerry still gave us a call to check in. If we needed anything, we knew they were just a text or phone call away. 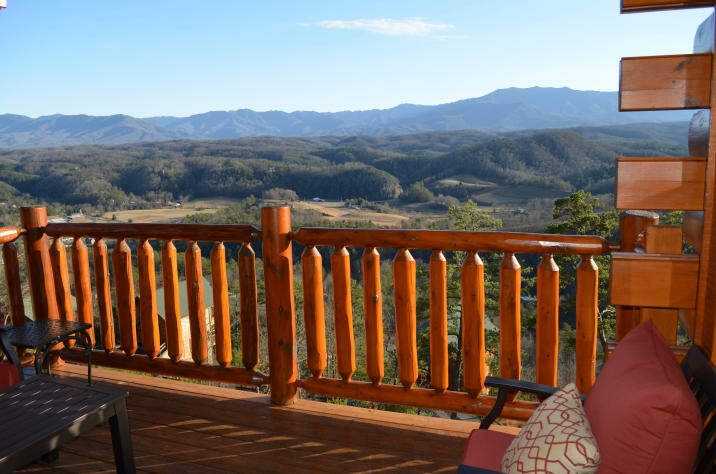 Both decks in the cabin are great to relax on, and it's in a good location to get to both Pigeon Forge and Gatlinburg, but far enough away from the bustle. Photos can't really do the views justice - the mountains are so much more immediate and breathtaking when you're there. I found the kitchen to be really well-stocked for cooking utensils and appliances, and there's a Kroger right in Pigeon Forge for easy grocery access. I would stay here again for sure if we find ourselves sin the area again. Amazing Views and Amazing Cabin !!! The cabin is awesome. It is beautifully decorated and fully equipped with all of the appliances you may possibly need. The arcade machine and hot tub were big hits! Mary and Jerry responded to all of our communications in a very timely manner. The cabin "manual" was very helpful. The view from the cabin is what makes this place!!. The pictures do not do it justice. The view is simply amazing!!! There are no words to describe the breath taking beauty of the mountain view. You will not be disappointed. Two thumbs way up!!!!!!! The cabin is located in the Legacy Mountain Resort. There are other cabins about 50 feet away on either side, but windows do focus on thee view, so it feels quite private. There is also a decorative electric fireplace in the bedroom. There are about 6 steps to reach the door, and another step at the door to enter the cabin. There is a full bathroom on the main level.